Clean the area around the tooth thoroughly. Rinse the mouth vigorously with warm salt water or use dental floss to dislodge trapped food or debris. DO NOT place aspirin on the gum or on the aching tooth. Children should not receive any aspirin by mouth either. Give Tylenol (acetaminophen) or children's Motrin (ibuprofen) for pain and see a dentist as soon as possible. Find the tooth. Handle the tooth by the top (crown), not the root portion. You may rinse the tooth, but DO NOT clean or handle the tooth unnecessarily. Try to reinsert the tooth in its socket. Have the child hold the tooth in place by biting on a clean gauze or cloth. If you cannot reinsert the tooth, transport the tooth in a cup containing milk. See a dentist IMMEDIATELY! 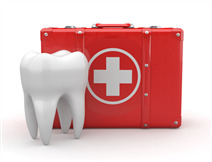 Time is a critical factor in saving the tooth! Permanent teeth can be saved; do not try to re-implant baby teeth. Rinse dirt from injured areas with warm water. Place cold compresses over the face in the area of the injury. Locate and save any broken tooth fragments. Immediate dental attention is necessary. Fold and pack a clean gauze or cloth over the bleeding area. Have the child bite on the gauze with pressure for 15 minutes. This may be repeated once. If bleeding persists, see a dentist. If a broken appliance can be removed easily, take it out. If it cannot, cover the sharp or protruding wires with dental wax, cotton balls, gauze, or chewing gum. If a wire is stuck in the gum, cheeks, or tongue, DO NOT remove it. Take the child to a dentist immediately. Loose or broken appliances which do not bother the child usually do not require emergency attention.